Have you ever dreamed of flying? 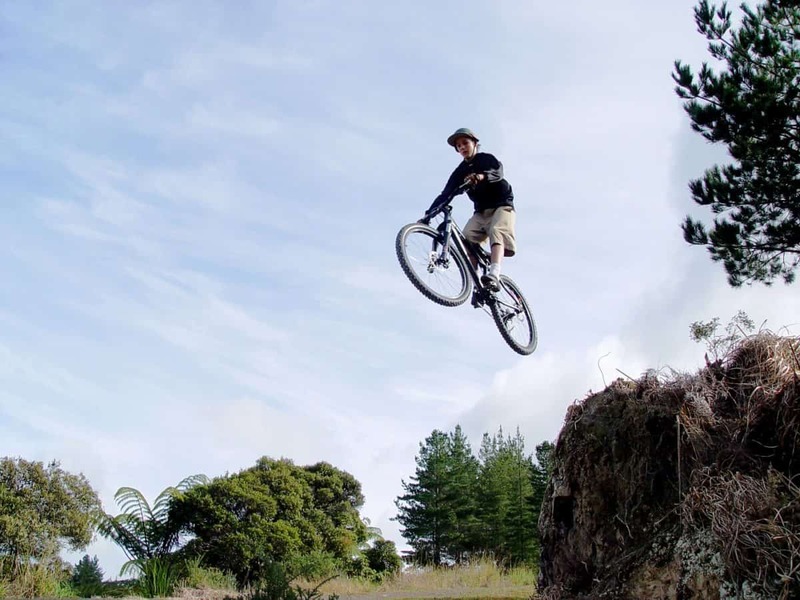 Learning how to jump a mountain bike is the next best thing. Plus, this activity opens up a whole world of fun. Getting airborne is a wonderful feeling and learning to jump will allow you to ride more difficult trails. However, using the correct technique is critical to your safety. Remember, there is more to jumping than just hurtling at a takeoff and hoping for the best. Here at The Adventure Junkies, we want you to be safe as possible while having fun on your bike. 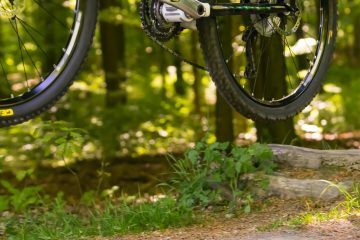 So, we offer you this tutorial to guide you through the steps for you to start safely jumping your mountain bike. Once you have learned the proper technique, jumping a mountain bike is actually easier than it looks. To jump properly and safely, you need to combine the techniques that you have already learned from pumping and bunny hopping. If you are not confident doing these two techniques, then please learn to do them first. 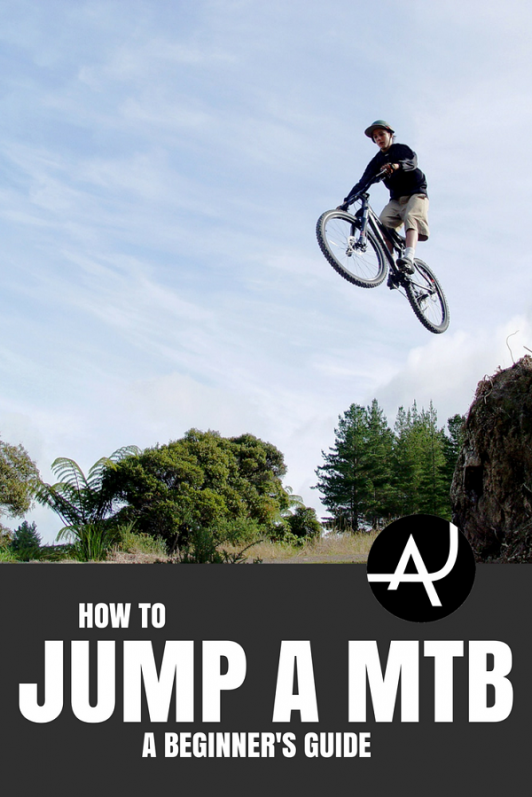 Once you’ve mastered these, then come back to this article to learn how to jump a mountain bike. If you are confident with pumping and bunny hops, then it is time to find some jumps. The best kind of jump to learn on is a small tabletop with a gradual take off and landing. A steeper take off and landing will throw you higher into the air and require more precision when landing. Both of which are dangerous when first learning to jump, so start with something small. A tabletop jump is one pile of dirt with a flat area between the takeoff and landing. This is best for learning on because if you do not jump far enough, then you can still safely land on top of the jump. As you progress, you can move on to doubles, which are two separate piles of dirt with a gap in between. Don’t forget to put your on helmet. Wearing your gloves and knee pads are also advisable. Also, make sure that everything on your bike is in working order before you start! Jumping combines the pumping and bunny hop techniques, but you do not perform all the movements at once. They have to be done in a certain order to get you safely into the air. Timing is critical and will be different for each jump. Follow the steps below and fine tune the timing until you are easily clearing the jump. To get used to the feel of the tabletop, roll over it a few times. You should already be familiar with how the bike will move from riding pump tracks. Gradually increase your speed. As you hit the takeoff, pump your bike into it. This will compress your suspension. The rebound from your fork (and shock) help get you into the air. As the front wheel reaches the top of the takeoff, pull up on the handlebars like you would at the start of a bunny hop. The idea is to keep the wheel moving in the same direction in which the takeoff is leading it. As the back wheel reaches the top of the takeoff, jump with your legs. Again, this is similar as when performing a bunny hop. If you have rear suspension, concentrate on timing your jump with the rebound from the shock. Combining the energy from the two gets you into the air. If you do not pump and jump, you will not have balance as you get airborne. 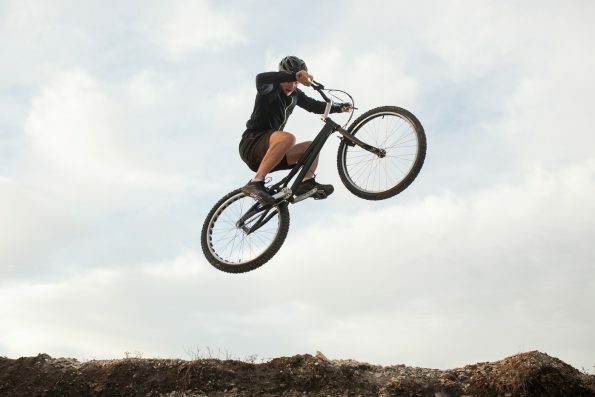 Passively rolling into a jump and just pulling on the bars is never a good idea as you will be off balance, causing you and your bike to shoot off sideways or tip over in the air. Pumping helps keep everything balanced. Even with bad timing, you will takeoff. Once you are in the air, push and twist forward with your wrists and scoop with your feet (again, just like a bunny hop). This is necessary to the maximum height out of the jump. Your bike will go through a natural arc anyway. 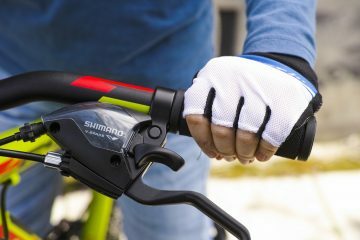 The push, twist and scoop will help it to do so, ensuring that your bike is angled down for the landing. Look at where you will land and aim for it. Your goal is to get the angle of your bike to match the angle of the landing and for your front wheel to land first. Repeat the steps and keep practicing until you can easily clear the jump. Get a feel for the role each of the steps has by tweaking the timing. Try experimenting by pumping more and less or jumping sooner. BikeRadar has a great article that talks about the timing of weight transfer. Watching the video will also help you visualize the techniques. Going faster is an easy way to clear a jump. However, you will find that it is possible to clear the jump at a much slower speed by getting the timing and force from the pump just right. Slow down your speed and really stress the movements to get maximum height from the techniques as opposed to focusing on speed. When you are in the air, turn your handlebars to one side slightly before straightening up for the landing. Not only does this look stylish, but it also helps you stay in control. By moving the bars, you keep your body loose, balanced and responsive to other movements. This becomes important later on with the bigger jumps as you can easily respond if something unexpected happens. Staying motionless on the bike in the air is a recipe for disaster and is known as a “dead sailor” situation. Once you are confident jumping your small tabletop, move onto bigger ones. When you are clearing bigger tabletops, move on to doubles. Don’t be scared! If you get intimidated by the gap in the middle, it helps to stop and just take a look at it. Think about the size of tabletops that you have jumped in comparison and you will realize that you can clear it easily. The bigger the jumps get, the more accurate you have to be with the timing. Be more aware of the speed coming into them as well. Bigger jumps tend to have steeper landings. You do not want to overshoot by going too fast. For this reason, it can be helpful to follow someone else with experience on the same technique when you’re going for a new jump so you can match their speed. One day, you will find that trail features start to look like jumps or at least, takeoffs. This is a good thing and you can have loads of fun jumping off lips and bumps on the trail. 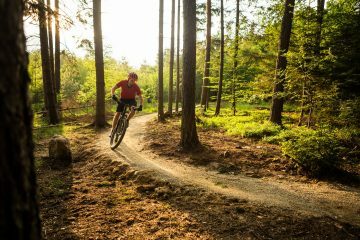 Think about using trail features to jump over technical sections or pre-jump a drop. Progress to doubles, hip jumps. Get to the pump track and see what you can jump there. Trail features will start to look like jumps, too. You will find that you can use parts of the trail to jump over or down technical sections. If you are lucky, there will be a dirt jump spot in your local area. Depending on the local laws, they may be easy to find or hidden in the woods. 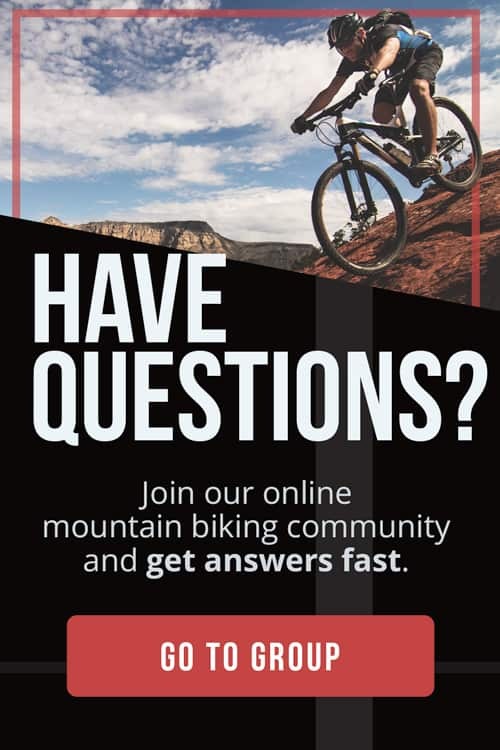 A good place to start is by asking at your local bike shop. Hopefully, there will be beginner jumps there for you. Remember that dirt jumps do not build or look after themselves. If you cause any damage by casing a jump (dislodging the dirt on the top of the landing by coming up short), then you should fix it. Many jump spots will have an unwritten “No dig, no ride” rule. If you can, bring a spade and a rake along and tidy up the jumps a bit. No one will force you to do so but if the locals see you helping out, then they will be more open to helping you refine your technique. 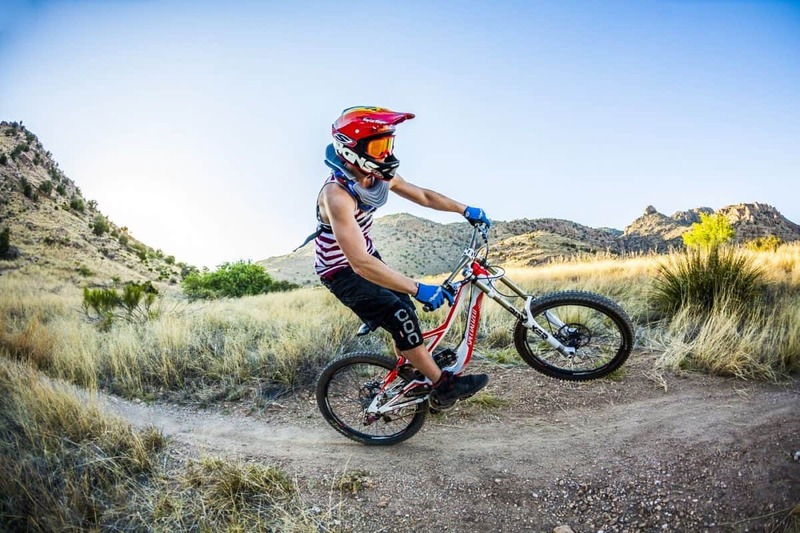 Originally from the UK, Richard is a passionate mountain biker and mountain bike guide. He is currently on a never-ending mission to travel the world and ride in as many places as possible. Richard is happiest when he is on a mountain bike and loves to share the experience with others. Do you want to save money on MTB gear? 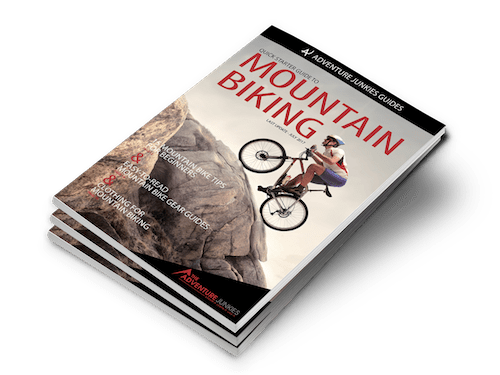 Enter your name and email to get instant access to the Quick Starter Guide to Mountain Biking, which has been used by tens of thousands of people to plan and prepare for their cycling adventures! Plus, you'll get exclusive content in our newsletter to help you make the most of your time on the trail! Along with the guide, you'll get exclusive content in our newsletter to help you make the most of your time on the trail!